I am only laughing at this because I don’t want to appear thick. So, if you fixed, the share incorrectness would increase? I somehow managed to groan silently at this one. So degrees were fully misused, right? 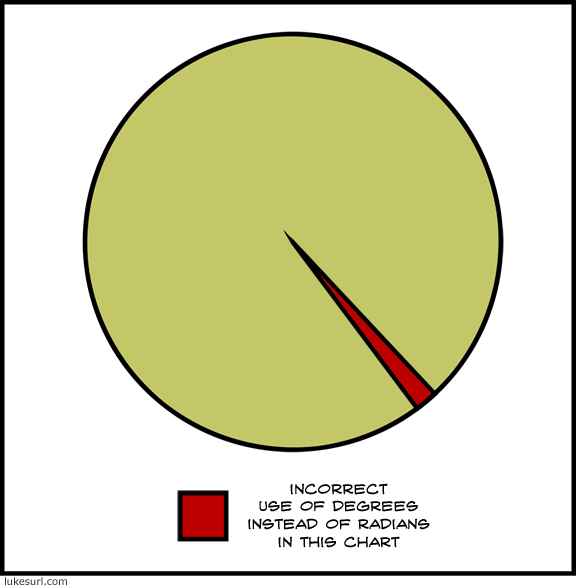 But instead of the red part being the whole circle (6.28 radians) like it should have been to represent 100%, it was just a little sliver (6.28 degrees)? Yes, exactly, that’s what it represents. The graph is entirely flawed, meaning 2pi radians of the circle (ie the whole circle) should be colored red. Since it is represented in degrees, it is now only 2pi (6.28) degrees. Tau. 2pi=tau, and it’s a lot simpler for most equations. Spread the word.